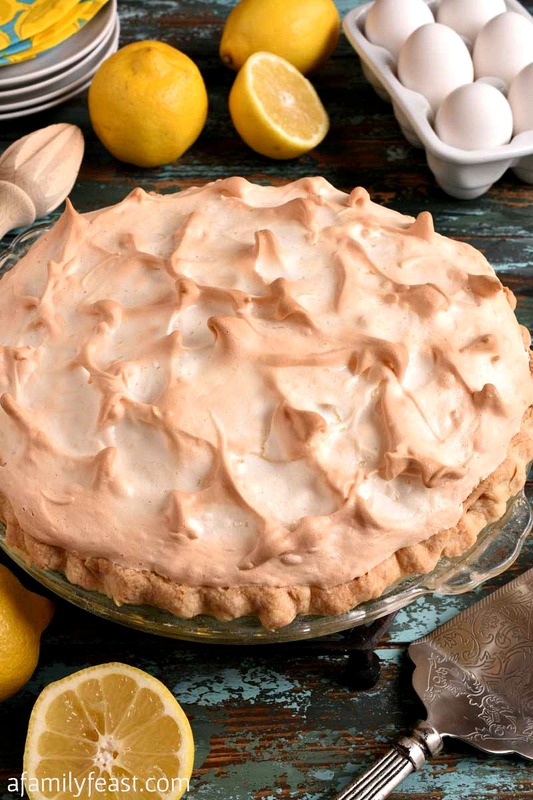 Lemon Meringue Pie is a classic that everyone should have in their recipe collection! Lemon Meringue Pies are absolutely delicious, but they sometimes have a reputation for being difficult to make. 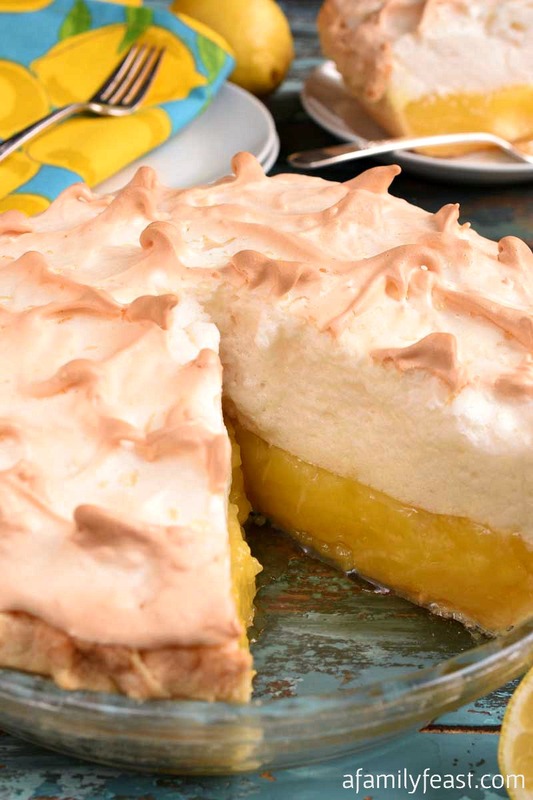 In reality though, it’s not at all difficult to make a Lemon Meringue Pie: You’ll pre-bake a pie crust, fill it with a lemon custard, then top it with an egg white meringue before baking. 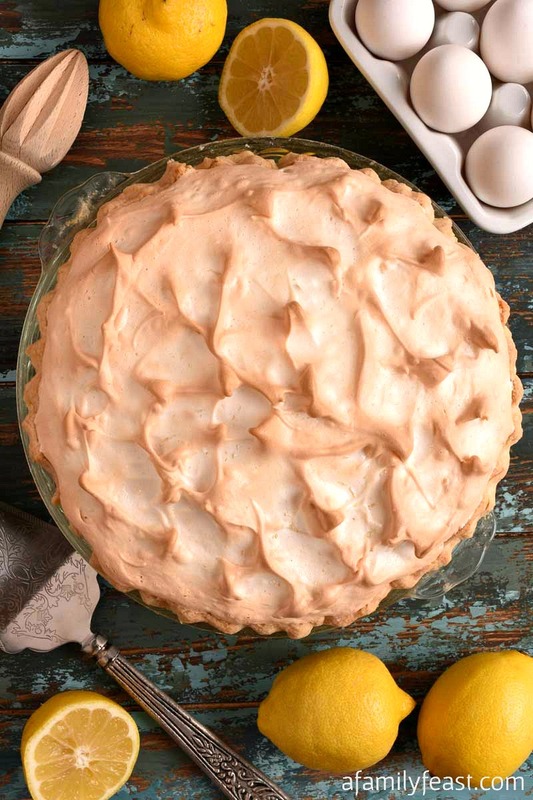 The pie crust and lemon custard are quite easy to make – and our recipe below includes a delicious homemade pie crust recipe, and an easy to follow lemon custard recipe too. 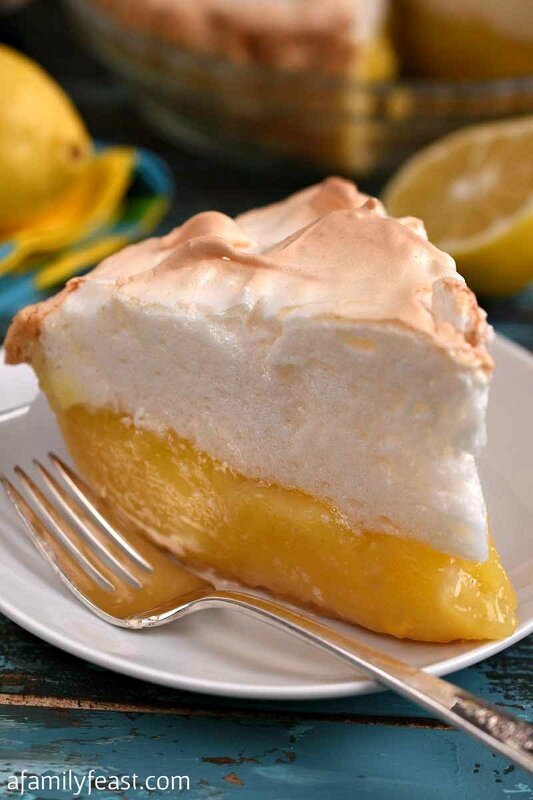 And there are just a few special steps you should take when whipping up the egg whites, to ensure that you make a perfect topping for your Lemon Meringue Pie. Full disclosure here: Jack made this Lemon Meringue Pie three times before perfecting the recipe. And even then, Jack still thinks he should have whipped the egg whites another minute longer before baking the pie you see in the pictures here, and he also thinks he could have baked it a minute or two less. Have fun mastering this classic and delicious pie recipe! 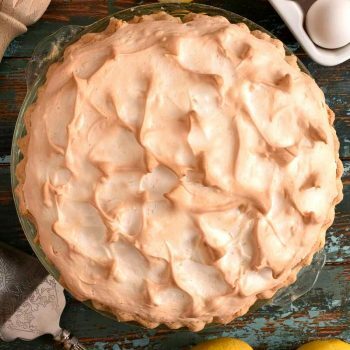 Note: You’ll want to make this Lemon Meringue Pie in a deep dish 10″ pie plate. Remove dough and on a floured surface, roll dough so that it is two inches larger than your standard 10” pie plate, not a 9” pie plate. Place the dough over the pie plate and gently press in and up and over the edges. With a knife or scissors, cut extra. Pinch the overhanging dough into a high ridge all around and then go back over and a make decorative edge, again, keeping it high. (We use thumb and index finger on one side and the knuckle of index finger on the opposite side and pressed together to make a scalloped edge.) Place the completed pie dough in the freezer for 30 minutes to set up so that the sides don’t collapse while baking. Preheat oven to 375 degrees and once the pie plate with the dough sits in the freezer for 30 minutes, remove, add parchment and either pie weights or dry beans. (To make the parchment fit, cut parchment into a circle larger than the pie plate and make four slits a few inches long around the edge half way to center so when you place it in the shell, the slits overlap and fit up the sides.) Place in the oven for 20 minutes. Remove pie weights or beans, and with a fork, puncture the bottom in a few places to release steam and place back in the oven without the weights and parchment and bake for ten more minutes. The shell is now ready to be filled. Preheat oven to 325 degrees F. Place rack in center of oven with no top rack to make room for height of pie. Make the filling by heating the water, sugar, corn starch, lemon zest, lemon juice and salt in a medium sauce pan until hot and the sugar has dissolved. Mixture will be thick. Place the egg yolks in a medium bowl and temper them by adding a little of the hot liquid at a time while whisking. After adding about a cup and a half, stir the tempered eggs back into the sauce pan. Stir in the butter and cook this mixture on low for another minute. Remove from heat and set aside. 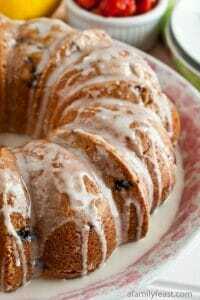 With mixer running on low, add sugar then increase to high and whip to stiff peaks. When you lift the beater, the peak stands up straight and doesn’t flop over. Pour the lemon filling into the prepared pie shell. 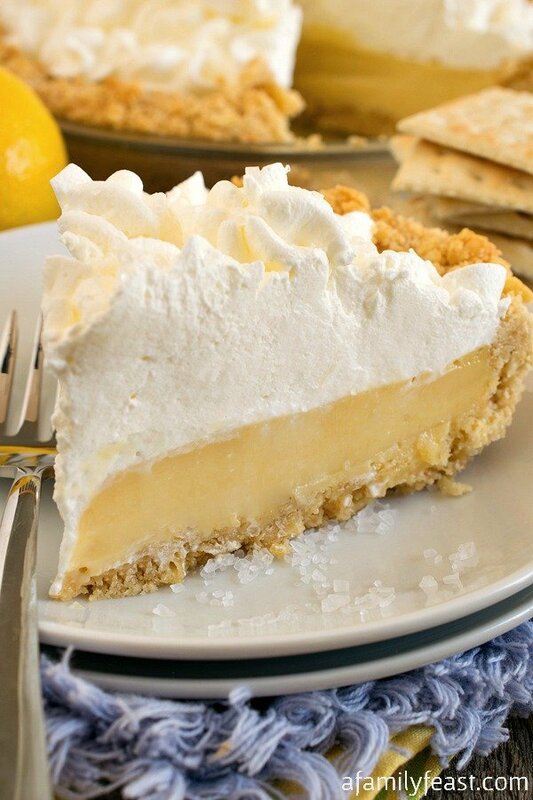 Spoon the meringue onto the lemon filling by starting on the edges and working your way to the center, mounding the pie high. Then take the back of a soup spoon and press and release all over the top of the meringue to make little decorative peaks. Place in oven and bake 20 minutes, no longer. If you over bake, it will weep later and the meringue will pull away from the sides. Let cool five hours. As it cools, whatever meringue was not quite set, will finish setting. Do not refrigerate while cooling. Once cooled five hours, slice and enjoy or can be refrigerated at this point. Note: Try not to touch the top of the pie after baking. Meringue is very sticky and a small finger poke will pull up a section of the browned and baked meringue. I followed the recipe to a tee. The lemon filling NEVER set. It was for my husbands birthday, as he did not want a cake. I am an excellent baker, pies, cakes, cookies, etc. 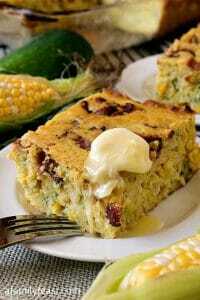 Thought I would try this recipe as I needed a deep dish 10″ pie. Could not find the recipe that I had. I was told that at higher elevations, more cornstarch is needed? Should have been mentioned. Put so much time into this pie and needless to say. Ruined my husbands birthday ! 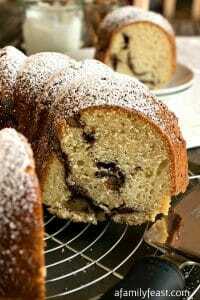 Hi Barbara – Thanks for your feedback and we’re sorry the recipe was a disappointment (especially for your husband’s birthday)! 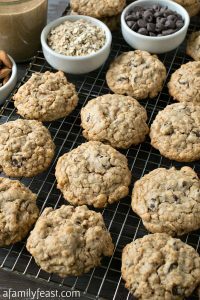 Living close to sea level ourselves, we definitely aren’t experts on baking at high altitudes and actually never include high altitude instructions in any of our recipes, since we have no experience with it and wouldn’t be able to test the substitutions or adjustments on our end. What little I do know of high altitude baking – I would have thought you would have had more issues with the egg whites/meringue vs the lemon custard. We do think more cornstarch would have helped thicken the custard – but that would have been our suggestion regardless of your altitude. Either way – we’re sorry to disappoint. You may enjoy another blog called Mountain Mama Cooks – she has a section on high altitude cooking here: https://mountainmamacooks.com/high-altitude/ – and in skimming through her cheat sheet just now, reducing the sugar in the lemon filling might be another option for you. Thanks for taking the time to write to us. 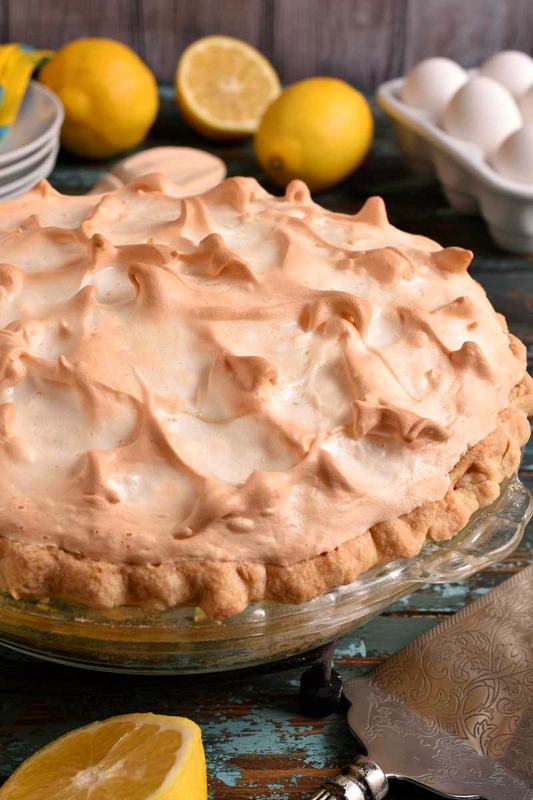 Do you have a butterscotch meringue pie flavor recipe? Hi Abby – No – I’m sorry, we don’t. My mother used to make me lemon meringue pie instead of cake for my birthday. A cherished memory (now that she’s gone) is that when she got older, she didn’t see that she left some of the seeds in! Such a nice memory Jeannette (seeds and all!) 🙂 We hope our recipe is as delicious as the one your mom used to make. Thanks for writing to us today! Hope you’ll give the recipe a try Diego!